Honda has pulled yet another hat trick in getting most out of a small displacement engine. It has made it known that a new sports model, slated to be launched in 1989 will be powered by a double overhead camshaft, four-valves-per-cylinder, inline four-cylinder engine of 1.6-liter cubic capacity whose power output will be 119 kW, or 75 kW per liter (current Honda twin-cam engines average about 60 kW per liter). And this one is not relying on an external air pump, either mechanically- or exhaust gas-driven. Everything is within the engine proper, more specifically in the machined and tightly configured light alloy cylinder head. It incorporates a patented variable valve timing and lift system. connecting shafts and lost-motion spring. There are two intake and exhaust valves per cylinder Vee-inclined in a pentroof combustion chamber. There are three cam lobes and three rocker arms per pair of valves. The cams have different profiles and lifts. On either side are "primary" or low-mid-speed cams, flanking the lone "secondary" or high-speed cam. Obviously the secondary power cam has a wider opening and a higher lift. A senior Honda engineer confides that lifts of the prototype 1.6-liter engine are five and eight mm for the primary cams and 10 mm for the power cam. The primary eight mm-lift cam operates via rocker arm its intake valve first, letting in mixtures and generating swirl motion. The second secondary valve follows, further filling the combustion chamber. At this time, the center power cam is sitting idly, and so is its rocker arm which is pressed against the cam by a lost-motion spring. generating swirl motion of incoming charge. Narrowest left cam has smallest overlap and lift. 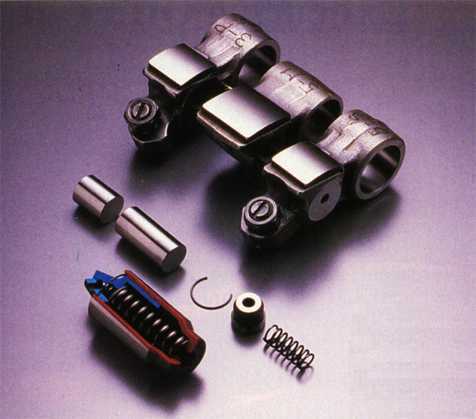 At higher rpm, a hydraulically operated piston pushes in a two-piece pin, interconnecting the three rocker arms which now act in unison, operated by the center "power" cam that opens the valves longer and lifts them higher for producting more power. 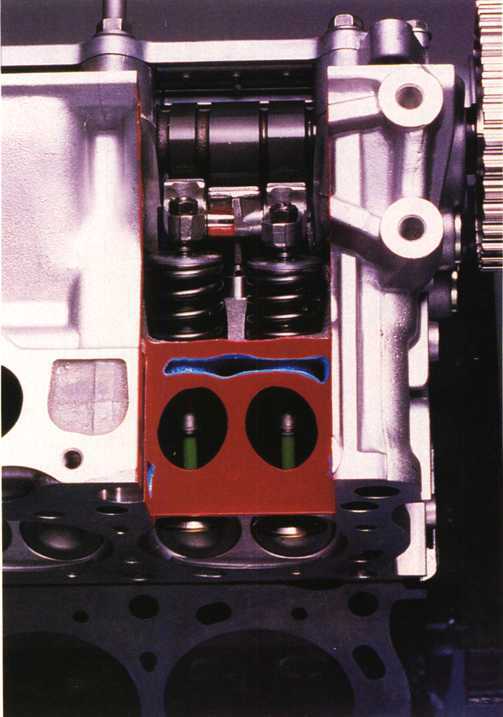 Interconnection of the three rocker arms is controlled by an ECU that gathers signals on engine rpm, load, vehicle speed, water temperature, and other relevant data. The new engine has bore and stroke of 81 mm and 77.4 mm for a total cubic capacity of 1595 cc, producing a 154 N·m maximum torque, and has a maximum allowable rpm of 8000. The variable timing and lift system is adopted on both intake and exhaust. Metallurgy is one area Honda has learned greatly from racing activities, and its lessons are well used in the variable timing and lift engines, whose valve train is obviously subjected to higher forces and stresses. Reciprocating mass needs to be as small as attainable. The valve spring retainer is forged from sintered and extruded aluminum-ceramic alloy whose ceramic content is about three per cent. It is about 60% lighter than a conventional retainer. Honda is proud that it has perfected a casting technique for steel camshafts. The high carbon- and chrome-content steel alloy camshaft has an excellent anti-pitting property, superior by 50% to a conventional cast iron variety, claims Honda.